Celebrations all around. There was deepavali, which meant friends, family and food! The DVD of the felicitation function of Veena Dass at Delhi had arrived and we all watched and commented and critiqued and appreciated everything, so there was a lot of noise all through the session. In the midst of this, some Ikebana was also done. Prerana had done a combination vase arrangement, using seven kinds of material, with a tone of brown/rust. With some corrections from the sensei, it ended up looking fabulous, but of course before I got down to taking a picture, (I was busy chattering away, you see), it got knocked a bit, and so sadly I dont have a record of it. I quickly made sure I took pictures of these arrangements, though! Another celebration has been the golden wedding anniversary of our sensei, and what better way to say it than with flowers!! A lovely bouquet arrived at her doorstep, courtesy all the Group members, and she was inundated with phone calls and messages. It was an unusual day for the "anniversary couple", as he had to go off to the dentist and was restricted to soft food, and she had to supervise the painters, carpenters and other workers, who are currently working in their home!! We all pray for their good health and long life, and many more years of togetherness, and may sensei Malathi continue to guide us all though our Ikebana learnings! The next meeting at Meenu's, where we celebrate her new teacher's certification! What did I say, celebrations all around isn't it?! 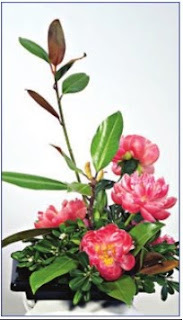 Baiko has posted a series of four arrangements using Lotus. Please click on the link and enjoy! "There's something fascinating about the color white that's able to draw out a diverse range of possibilities. 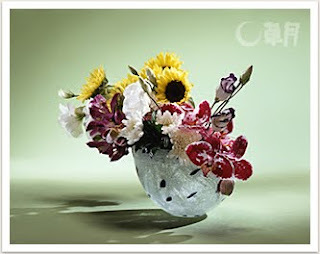 Cute blue dots are interspersed over the white glass vase while floral colors are scattered around the white background. Together, they aim to create a harmonious closeness between the vase and flowers." I love berries in ikebana. And so I like this arrangement because of the lovely "Karaunda" berries used here. They are the sour ones that make awesome pickles we find in Northern India. They are pinkish-redish-white in colour!! There is a very interesting and amazing story behind this picture. 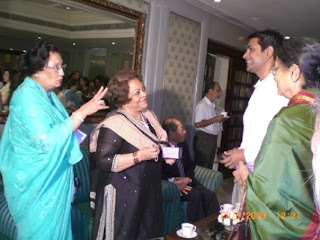 In this picture, you see Mrs Veena Das showing "Two". Actually she was narrating this incident to me -There was this man who was heavily addicted to drugs for Two years! He couldnt kick the habit, though he wanted to. Someone directed him to Mrs Dass. 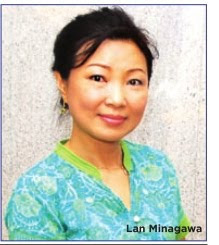 He then took Ikebana lessons. Unbelievable, but true, through the magic of flowers and the power of the beautiful art of Ikebana, this man totally gave up his addiction to drugs!! Wow! I mean WOW !!!!!!! Nothing more to be said !!! I was speechless!! Well, I had missed out some pics from the first album on facebook. So here is another link. Just click this line and you can see the 40+ pics also!! Enjoy!! Some more arrangements from "Celebrations"
Senpei Veena Dass Created a big arrangement. It was titled "Seasons". It was done on a square platform. In the centre were green Bamboo Poles. Around it, on the four sides, each season was depicted. It was difficult to get the whole work in one photograph. So I have taken the 4 of them separately. Here it is for you! "Autumn" was evident from the brown, yellow and orange colours of Thistle and Bird of paradise and from the Citrine Fruits !! And "Winter" from the white, the pine branches and the soothing blue and violet colours!! 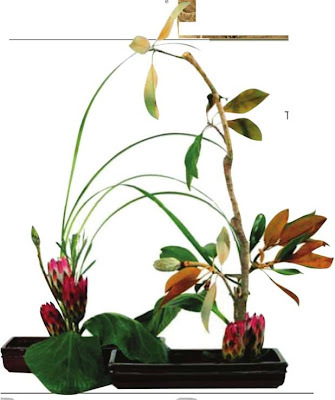 The work that you see below is a "Rikka Shimputai" of the Ikenobo School of Ikebana. This is the work of Mr Vivek Rao from Bangalore. This work by Mrs Indu Punj was titled "Contentment" or "Commitment" - (Sorry I dont remember which one). And this one a beautiful "Dancing Peacock" by Ms Savita Grover!! Also, these combination Leaf-like vases were very interesting. The arrangement was by one Ms Ritika, if my memory is right. (Correct me if I am wrong). Here, I would like to post pictures of some arrangements that I liked. Only a few of the many. This arrangement was liked by all, I am sure. The colour, the lines and the harmony is very striking. I dont remember the name of the artist. You can enlarge the pic and see if you wish. This simple but lovely arrangement is by Avni Chug. 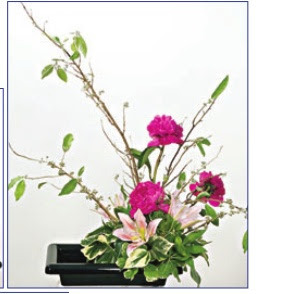 This is a "Rikka Shofutai" arrangement by Mr Vivek Rao of Bangalore. This a classical Ikenobo School Arrangement. I am sure everyone can make out the difference. 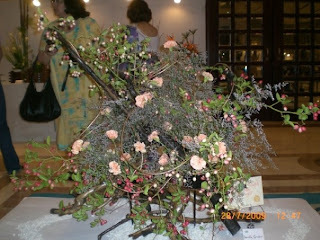 This style of Ikebana is more than 500 years old, Mr Rao told me!! Wow! This is an Ohara School style Landscaping by Mrs Rahmatullah. This senior Ikebana member from Mumbai and had come for the exhibition on a wheel chair - She lost one of her legs recently! Whoa! Thats some spirit! Some Dedication!! These two pictures form one single work. This large work was spread over a big table! Life comes a full circle in Mrs Indu Punj's "Fulfilment". I like it for the theme and depiction. Some bright yello orcids and greens on the top right signifying her childhood, the asia lilies for the youth, the strong wood and other flowers for her mature years and to the left top dried bamboo for the old age where there is nothing more to achieve! There is only peace. Contenment. Fulfilment !!!! This gorgeous natural arrangement is by Mrs Kanta Bukhari! The pond scene created using Bullrushes, Lilies, reeds and Driftwood in a Japanese golden disc-like vase was magnificient!! Bullrush is my most favourite material - I know you all know :) The lily had an unsual pink colour, I thought it is an artificial flower. Mrs Bukhari later told me it is from her garden! And people, before I sign off Here is one lovely arrangement from Mrs Ahluwalliah (did i spell it right? sorry, if i didnt). Absolutely gorgeous. Simple but gorgeous. The blue vase is from New York and looked like paper strips folded. She has created the amazing space with Kiwi Fruit Vines and added the flowers (sorry i cant recollect the name) for colour in a beautiful way. All of us liked this very much!!! I am as relaxed and a bit lazy even to write today - as much as I was the morning after the exhibition.. The most important job over, we were all free in the mind. By 11.00am we had to be at Mrs Veena Das's residence for a Coffee Morning. We reached in time. The other guests had started to arrive. We were given a warm welcome by the graceful Mrs Dass. I couldnt take my eyes off the huge Tanjavur Painting of Subrahmanya-Valli-Devayani that adorned the walls.! And there were many Ravi Varma prints of Lakshmi & Saraswathi!!! The heads of chapters who had come from outside Delhi spoke on the occasion. Mrs Dass was congratulated for organising this exhibition. Mrs Indu Punj touched everyone's heart by reading out the words that came straight from her heart! She woke up at 3.00 am and wrote those beautiful words. She spoke about all the lovely years they worked as a team. And about the dedication of Mrs Dass to Ikebana. Mrs Veena Dass spoke about the remarkable support Mrs Indu Punj and Mrs Uma Sharma gave her in planning and organising the event. She also thanked the entire team for all the help and support, without which the whole event would not have been possible. Tea was served. It was a sumptuous feast :) It should have been called lunch! Sorry, I find it difficult to describe the unmatching hospitality of Mrs Veena Dass. All I can say is that she is one amazing & great lady!! Thank you Ma'am for everything! We left around 1.30 in the afternoon. We headed off for some shopping. We picked up some nice vases from the Art D'INox at Khan Market. 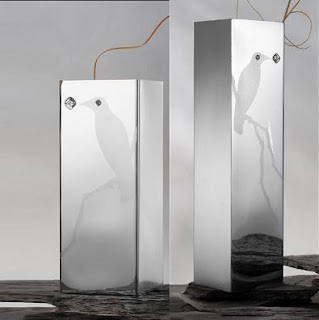 For example these cute steel vases with crows on them that Dally picked up..! Here I must give a million thanks to Meenu for taking us around the trip, never bothering about her badly hurt leg!!! We wish you a very speedy recovery Meenu! We had time just enough to come back to our rooms, freshen up and change and head for Dr. Kusum Ansal's residence for evening tea. There also we were treated to a huge feast! Thank you very much Mrs Ansal for your tremendous hospitality! Malathi Sensei wanted to see the house of her teacher Mrs Uma Rao and also the house where she lived in Jhor Bagh! I took a picture of Mrs Uma Rao's previous residence from the car. The watchmen got suspicious on the camera flash and came running to us. We had to explain to them what was happening :) However, I heard that the watchmen at the Jhor Bagh residence were very friendly and Sensi took some nice pictures. She might have felt very nostalgic, I can say! I wasnt there because a frined of mine who went to school with me was coming to meet me. We were meeting after 25 years!!! Yes, a quarter century!!!!! We had a great time having dinner. I came back at about 11.00 pm. And started to pack all the remaining flowers into one box. Then every pin holder, cutter, the masala box and my own suitacase... Wondering whether we would be fortunate to have Drama-At-The-Airport which we so much missed on our onward journey!! I hit the pillow at about 1.45 am only to be woken up at 3.30am... By 5.00 am we were all out and in the car!! We said our bye-bye to IIC and were at the airport at 6.00. Again, to our disappointment nothing happened. All our bags were through, just like that. And no excess Baggage .. Phew!!! The flight was delayed by about 40 minutes. Landed safely at 10.40 and headed for our respective homes. Malathi Sensei was so sweet, she agreed for a lesson at 3.00 in the afternoon. Thats a great gesture, isnt it? I completed my Book 3 that day, though we were all tired. It was a very nice trip. Many nice memories.. We missed Ambika, Molly, Trishala, Chitra and Seetha. Well, there will always be a next time. It was a very good learning experience for all of us. I close my report here, thanking each one of our team for the great time. Especally both the Senseis. And to all the people at Delhi for the great opportunity. Bye for the moment.